Crises have a tendency to force the hand of those who would otherwise ignore the positioning of the global economic jet stream which is blowing strong winds of change. I had, what was intended to be, a slight detour on my way back from Davos via Geneva to London. Mother Nature extended my journey for a day, and as a result, I bumped into bankers and transport officials who saw our coverage from the World Economic Forum. They asked bluntly, “What came out of Davos 2009?” The answer can be summed up as -- a high profile dust up between Turkey and Israel over Gaza, thanks to Prime Minister Recep Tayyip Erdogan walking out -- a couple of tough speeches from Vladimir Putin and Wen Jiabao who opened the meeting -- and towards the end of the gathering, some fresh oxygen that was pumped into the Group of 20, as leaders and delegates began to pack their bags high up in the Swiss Alps. Before British Prime Minister Gordon Brown took the stage Friday, there seemed to be a lack of clarity in the efforts to bring 85 per cent of the global economy under one umbrella. As one senior finance official – who asked to remain unnamed – put it on the sidelines of Davos, this decision to move forward is “well above the pay grade of the Ministers of Finance. This, John, is at the Heads of State level and requires clarity.” He asked me to take my own reality check, hinting that things cannot move that fast. Shortly thereafter, I sounded out that discussion with Ricardo Hausmann, a leading economist from the John F. Kennedy School of Government at Harvard, who confirms there are active consultations taking place across the board. U.S. President Barack Obama did not show up at Davos, nor did his two top finance officials, as planned, but no one was eager to jump before Washington signalled it was safe to do so. In sum, old habits, like getting U.S. support, die hard. Hausmann made a solid point, while we flushed out the topic in the midst of hundreds of government officials and businessmen, “The G-20 jives well with the message of President Obama”. This is true. It is collective, equitable and disperses the burden of future challenges and decision making. At the same time, by its very nature of broader membership, it also dilutes power amongst those who are used to having it. Therein lays the problem. The G-20 already exists. The fact that it does not need to be created from scratch makes the debate over membership less onerous. The gap between the haves and the have-nots, not the rich and poor, but rather the surplus and debtor countries has never been greater. So co-dependency is at its peak. During a panel that specifically addressed global imbalances, Azman Mokhtar, Managing Director of Malaysia’s sovereign wealth fund Khazanah Nasional said, there is a danger that the world moves to the “lowest level of equilibrium”, meaning that we gravitate to lower standards of legislation, rush to print money, widen budget deficits and regret later that it could have been done differently. Victor Halberstadt of Leiden University in the Netherlands said, the “sense of urgency to address global imbalances is not there.” Hausmann then made an illustrative point comparing the airline sector to the rolling crises every seven to ten years in the global economy. Anytime that there is a crash, the airline business dissects every bit of evidence to try and take the risk out of travel and rebuild confidence. In the financial sector it is literally every man for himself. This is a bit worrying because of the trends that emerge during global downturns. For one, highly coveted foreign direct investment, that keeps the wheels of cross border transactions and trade well oiled, is expected to drop by up to 15 percent this year according to WAIPA, the World Association of Investment Promotion Agencies. That follows a record year for FDI of 1.8 trillion dollars. The Middle East saw its share of the pie grow to 43 billion dollars last year, a six fold increase from the year before. The last thing the region needs is for investment to dry up. In the United Kingdom, we see workers protesting that British workers should get British jobs, and finally President Obama is rightly trying to strike “Buy American” legislation out of the bailout package. The tendency to become protective of ones home turf is instinctual, but mistaken. In Davos, World Trade Organization Director General Pascal Lamy urged countries to pass the Doha Round to encourage more investment and lower trade barriers. I did not hear a lot of enthusiasm for that to be candid. The reality is, no one wants to see the U.S. or other G7 countries stumble and fall. If they do, demand for hard goods from China and Japan and for oil from the Gulf and Russia will stumble as well. So, the surplus holders from the Gulf and China are likely to continue buying the debt to finance budget deficits from Washington to London. But G7 countries should not bank on it. We know that countries from the Middle East to China have their own set of employment challenges to deal with. It is for this reason that Gordon Brown called for a “shared revolution” to bring countries under one roof in London in April. Let the power sharing begin, and hope that protectionism is put behind us. Two groups, one that already has 13 members, the other which looks poised to comprise 13 members, could potentially help stabilize and redesign the global architecture for the 21st Century. This all sounds quite grand, but the truth is the world is in need of some rebuilding in the aftermath of the tornado which swept through global markets in the past month. Sarkozy is referring to the so-called Bretton Woods institutions, named after the city in New Hampshire where they were created before the end of World War II. I was surprised that neither of those institutions -- the International Monetary Fund and the World Bank -- was given a mandate at their autumn meetings to re-engineer their structures to be the streamlined home for dialogue, financial regulation and monetary policy. Sometimes it takes a crisis to prompt action and that is where we are today. At the Gleneagles Summit in 2005 Tony Blair formally invited leaders from the G5: Brazil, China, India, Mexico and South Africa to begin outlining the blueprint for the new G13. According to many who attended that meeting, the new emerging economic powers thought the rule book was already written before they showed up in Scotland. That blew over like a cold wind off the Atlantic and talks have stalled ever since. The French President, who cut his teeth in the Ministry of Finance, is sensing a window of opportunity to move into action. While the current occupant of the White House may not be keen on building a new institution (and some may argue more bureaucracy) the future occupant just might be. And if a President Obama or President McCain doesn’t like the idea, come January there may be enough coal in this engine to leave the station anyway. As it now stands, the G13 will meet sometime after the U.S. election. UN Secretary General Ban Ki-moon has offered to host this gathering at the organization’s headquarters, perhaps as a bid to eventually put the remit for this fortified group under the United Nations umbrella. That certainly needs to be decided over time. But it seems clear that the G7 (G8 with Russia) needs to design something concrete, and stand ready to build in a regulatory framework to take decisions on capital flows and new financial instruments (like mortgage backed securities) and the role of sovereign funds. On the latter subject, it seems that if President Sarkozy and others are getting positioned to bring the developed and developing powers together it might make sense to consider a seat for the Middle East, representing both the sovereign funds and the oil producers. I never thought the number 13 was lucky; in fact I, like many in the world, remain superstitious about it. G14 has a nicer ring to it anyway. This week U.S. Treasury officials will tour the major economies of the Gulf in an effort to enhance the dialogue between Washington and the major sovereign investors. Riyadh, Doha, Abu Dhabi, Dubai and Kuwait are all on the itinerary. Rather quietly at the IMF meeting in Washington, 24 so-called Santiago Principles under the International Working Group of Sovereign Wealth Funds were presented at the gathering. The timing is fortunate. In a period where markets are swinging five percent in either direction, it is always good to have a pool of $3 trillion available in the shape of potential emergency lenders and long term investors. The Santiago Principles can provide the political cover for those still worried about their intentions. While the grand design of the G13 remains on the horizon, that other group of 13, OPEC, is trying to speak with one voice to recoup some dramatic losses. In a span of only 14 weeks, prices have dropped 50 percent. Three digit oil ($100 and above) seems long forgotten and the President of OPEC Chakib Khelil, has talked about protecting a price band of $70-$90 a barrel. The secretary general of OPEC, Abdalla Salem El-Badri, during a speech in Moscow this past week outlined the cartel’s plan to expand production by five million barrels in 2012. That, he says, will require $160 billion of investment. If prices go back below $70 and stay there, I would not bank on all that coming on-line. While the G7 is not eager in principle to have an official dialogue with a cartel, a G14 with a seat for the Middle East included in the mix, most likely would. That would not only be lucky, but prudent as well. Henry Paulson, who cut his teeth in one of the toughest shops on Wall Street to rise to the top at Goldman Sachs, finds an entirely different dynamic on Capitol Hill these days. One can charge ahead like a locomotive with great steam within the confines of your own company, but garnering support from both sides of the aisle in Washington during the eye of the storm is a whole new ball game. Secretary Paulson has teamed up -- quite artfully -- with Federal Reserve Board chairman, Ben Bernanke, despite their different personalities and backgrounds, one being a financier, the other an academic. Cries of “financial socialism” emerged from their Capitol Hill committee appearances for the $700 billion bailout package which has the U.S. government, and therefore the U.S. taxpayer, assuming all the risk for the gambling undertaken by Paulson’s former circle of bankers. While this remains a U.S.-led banking crisis, it is difficult to find a calm port in the storm. Bankers in Britain and continental Europe are still trying to count up their exposure. This week, the central bank in the United Arab Emirates set up a $14 billion pool of funds to free up lending, primarily in Dubai. Here in this column we have talked about the $1 trillion of projects now on the books in the region, a third of those sit on the sands of the U.A.E. The government is not eager for lending to freeze up and construction to grind to a halt. The market panic, which has gripped every investor in the past two weeks, hit as it became clear that a re-evaluation of Gulf currencies against the dollar was not a priority. As a result, foreign capital quickly exited the region when the sell-off spread. 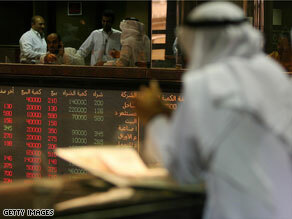 Most equity markets in the Middle East are down by a third from their peaks. It is a rare instance when the world’s financial disorder finds its way to the floor of the United Nations, but that was the case at the General Assembly where U.S. President George W. Bush told leaders that Washington was taking the “bold steps” necessary to turn the tide on the crisis. French President Nicolas Sarkozy, following up his recent efforts on the global diplomatic scene in Georgia and with the E.U. Med effort, is looking at the bigger picture. Sarkozy stated, “The 21st century world cannot be governed with institutions of the 20th century.” The French president is proposing a summit after the U.S. elections aimed at bringing together a cross section of the global economy, the G7 plus Brazil, Russia, India, China (the so-called BRIC countries) to discuss regulated capitalism. Broadly put, the regulators have been far behind the pace set by the commercial bankers who have come up with a whole range of fancy products that were bought by many but understood by few. That should change and coordination amongst the new and old economic powers needs to improve. The risks assumed by America’s brand name banks should have shown up like flashing red lights on the regulatory radar; ditto for the futures trading that helped drive oil prices to a record $147 a barrel this summer. The problem is the lack of a global regulator looking at the bigger picture these days. The International Monetary Fund, the World Bank and the Organization for Economic Cooperation and Development (OECD) all have their own briefs, but they have all been noticeably absent during this crisis. There has been an effort to expand the G7 to include five fast-growing economies, the BRIC countries, plus South Africa. That effort has stalled with some members of the G7 feeling threatened by the emerging players. If there is a silver lining from this crisis, it may come in the form of a rejuvenated effort to see eye to eye on a new financial architecture. While they are looking at new blueprints and new models, it should be more inclusive if the fast growing sovereign funds of the Middle East have a voice. While no individual country in the region can claim a seat just yet, it is pretty difficult to ignore the petrodollars and the $1.5 trillion now on hand for global investment. John Defterios’ blog accompanies the weekly business program, Marketplace Middle East (MME) that is dedicated to the latest financial news from the Middle East. As MME anchor, John Defterios talks to the people in the know, finding out their opinions on the big business moves in the region, he provides his views via this weekly blog. We hope you will join the discussion around the issues raised.